Our adult soccer leagues all have certified officials and sanctioned by the US soccer governing body. 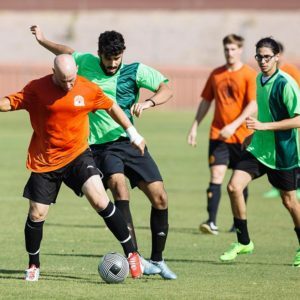 We strive to use the best soccer fields in the east valley while keeping the soccer leagues central to our soccer players. Our focus is providing a quality adult soccer league for people to enjoy and not worried about making the next World Cup squad. We are an adult soccer league but do know several youth soccer leagues we can refer you too. We offer soccer leagues on almost every day of the week. We have Over 35 soccer, coed soccer, women soccer, and men’s soccer leagues. Most of the soccer leagues offer several skill levels ranging from the casual soccer player to the skilled ones. In addition to our soccer leagues we run adult soccer tournaments. Most of our leagues are in Tempe, Mesa, Chandler, Gilbert among other cities. If you’re looking for a youth soccer league just ask, we can direct you to various local youth soccer leagues. Looking to join the soccer leagues? Simply click on the Free Agent option in the menu bar, the logo, or link and complete the form. We tried to make it short and painless because people would rather play soccer instead of filling out a form all day. We have posted a players responsibilities and obligations stating expectations from the participants regardless what league or event they do. It’s the responsibilities for every player to read and heed the policy. We compiled a list of soccer guidelines for the soccer teams, specifically for the soccer captains Take a few minutes to look through the following information. It will talk about how our soccer league operates. The Sports League receives hundreds of emails asking to play one of our sports, the most popular being soccer. Due to this fact we decided to create a page to help the soccer free agents find a team. Soccer is a physical sport and although we try to limit the physical play injuries still occur. The league does not provide coverage for the players but can help you find some if you requested. There are short term plans available at affordable rates. You need to have your own coverage. The league is not responsible for injuries. Everyone needs to sign a waiver before playing. We do require teams to have a roster. The rosters can be changed for the first few weeks of the season, but at some point we lock them down. The intention of the rosters is to help the referees to track stats and ensure teams do not bring in “ringers” to win critical matches. We require all the teams to have matching shirts and numbers. This is required to help facilitate our roster checks and the Golden Boot tracking. If you do not have matching shirts yet then swing on by the online store and buy some at discounted prices. If you’re a free agent or team that needs help collecting money let us know. We understand that joining a soccer team and not knowing the captain makes it hard to faithfully send them money, so we can setup a payment feature to pay your soccer fee online. It’s also beneficial at times for soccer teams to setup an online payment system so they do not have to track their players down.